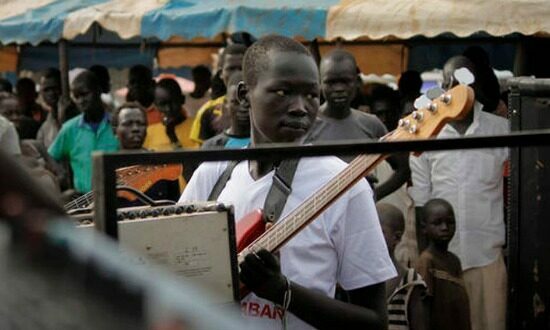 Musicians played lively tunes in South Sudan’s capital, and pedestrians and market shoppers watched the impromptu concert with curiosity. A soldier in desert camouflage walked around, surveying the scene. As the drumming grew more insistent, the audience stood silent and motionless seemingly afraid to join the fun. Then the soldier started to breakdance. That broke the ice and women swayed to the beat. Soon children and adults were dancing, enjoying a rare respite from South Sudan’s festering conflict. For many in South Sudan, the arts have become a rare haven of peace in a young country that has known little but civil war. 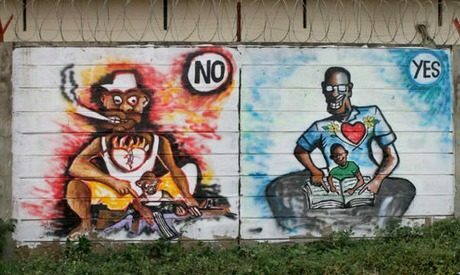 A group of artists are campaigning for peace, with pop-up street performances and murals across the capital, Juba. The activists have taken the name Ana Taban, or “I am tired,” in Arabic. “We are tired of this, the constant fear, the war,” said Manas Mathiang, 32, a musician and artist who leads the movement. Recently Mathiang met with nearly 30 artists who are part of Ana Taban. Members come from many of South Sudan’s main tribes. 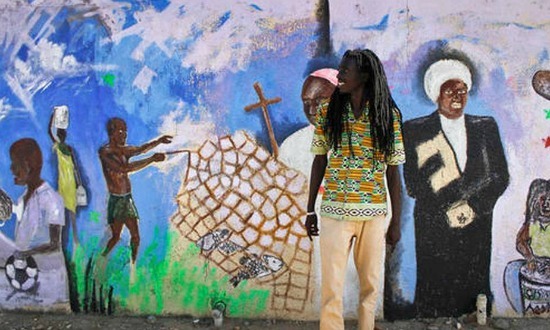 They say ethnicity has never been an issue, and they invite other artists “regardless of where they come from.” The group has painted vibrant murals in Juba like one near the airport, a sky-blue wall depicting athletes, religious leaders and doctors under the slogan “Let us all do our part.” The artists also stage skits in street markets to promote reconciliation. Ana Taban was started after fighting in Juba killed hundreds of people in July. A group of South Sudanese artists who had taken refuge in Kenya came together to create the movement. When it was safe to return to the capital, they brought home the campaign for peace. Transcending tribe and politics, the artists use their work to try to unify South Sudan, the world’s newest nation, which won independence from Sudan in 2011. But then civil war broke out two years later, and tens of thousands have been killed amid concerns of ethnic violence. 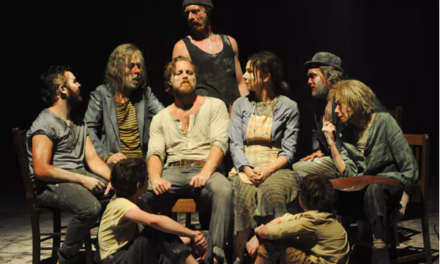 A longing for an end to the fighting can be found in the country’s art and music. Some of the most popular songs on the radio are reggae because their lyrics of peace can be easily understood, said a local DJ, Daniel Danis. Another member of Ana Taban, Deng Forbes, proudly held up his favorite work, a drawing of a child crying in the shape of a map of South Sudan. In some ways, South Sudan’s arts scene is like that in other countries, clustered in an offbeat section of the capital. Good equipment is rare. 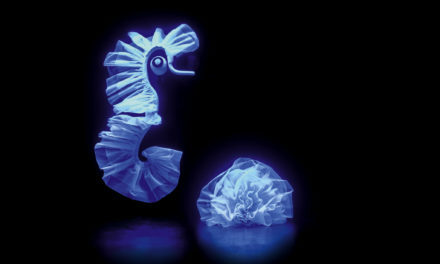 Artists say it is difficult to make money from their work. Feuds are common.But much of South Sudan’s art is focused on the country’s political tensions. Lual D’Awol, a popular rapper who appeared in an Ana Taban music video, said his songs about the lack of electricity and running water are banned from the radio by the government. “It’s telling the truth that citizens of South Sudan feel, and I feel like I have to paint that picture and give a message that is genuinely happening,” D’Awol said. Elsewhere in the capital, a nighttime concert a few weeks ago brought a rare feeling of ease. On a soccer field, roughly 1,000 South Sudanese danced and sang into the night, some climbing onto brick barriers for a better view. On a makeshift stage, young women danced with men wearing the colors of South Sudan’s flag, members of the dancing troupe Sonzwgi, which roughly translates to “storytelling.” The dance is a mashup of elements from different tribes across the country, said the group’s leader, Emmanuel Aban, saying it was choreographed to foster togetherness. 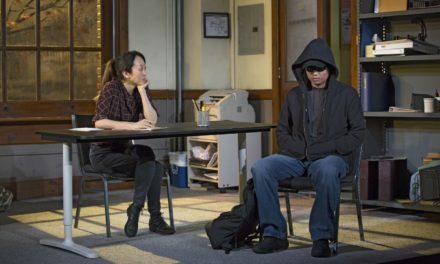 This article was originally published on Ahramonline.org. Reposted with permission. Read the original article.